Tony found me on online while searching for a local jeweller to have an anniversary gift made. I really appreciate when my fellow Cornishmen and women make a point of buying from their local area. It’s always a priviledge to work locally like this. 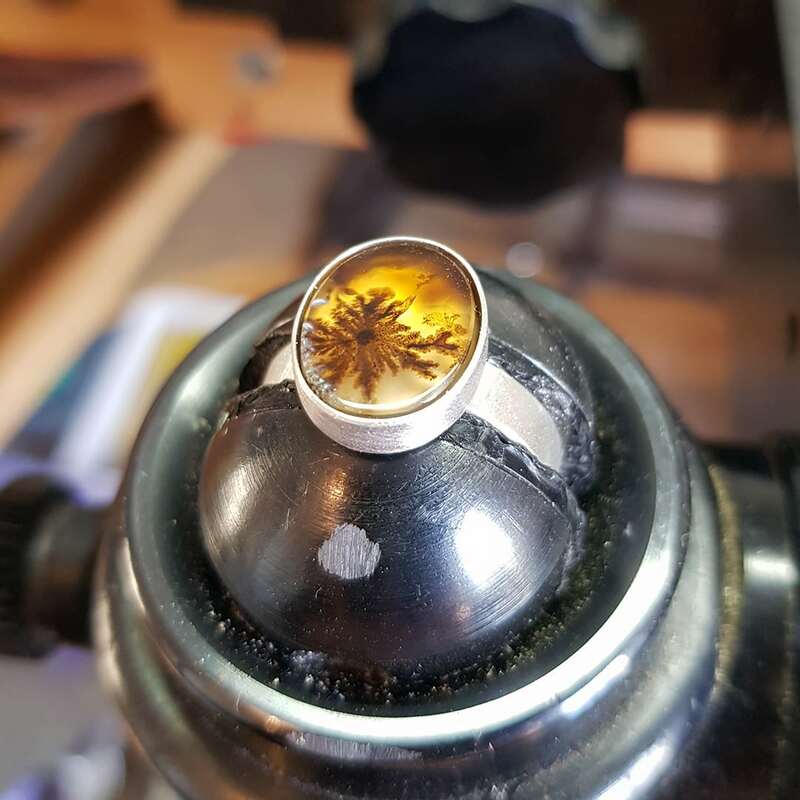 Tony wanted to commission a ring for his creative wife, for their upcoming anniversary celebration. It included a trip away, and the ring was to be presented to her then. He had an idea already of the style of ring he wanted as he had a good look at my current stock and previous work on my web site. Tony was after a very simple Scandi style ring in brushed silver with a gorgeous stone. We looked at my current stock and he really liked a ring I had with a dendritic agate. 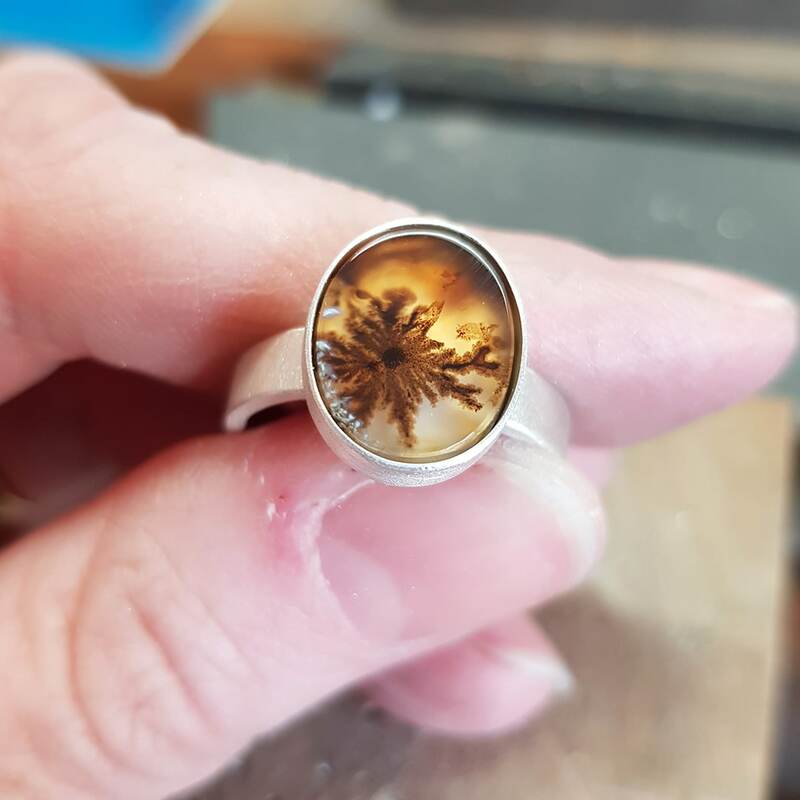 I showed him my stock of these beautiful and intriguing stones and he decided on this beautiful warm coloured stone with an amazing starburst pattern. Tony was sure his wife would love this particular stone. A simple Scandinavian style design is one that is very much in my aesthetic. It’s the contrasting but complementing style to my Cornish inspired work, such as the jewellery in the Rugged collection. 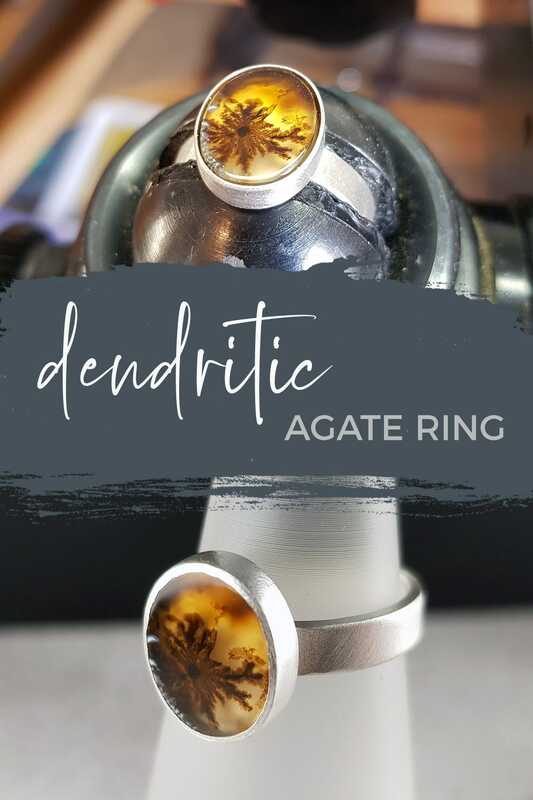 The dendritic agate ring was made with a very simple backdrop of silver to really let the amazing stone shine. The simple band and the pared back bezel setting really makes the stone pop and the striking pattern really gets to stand out. The brushed finish of the silver gives it a very relaxed and natural elegance. This is a perfect style for a ring to wear every day, which I hope this will be. 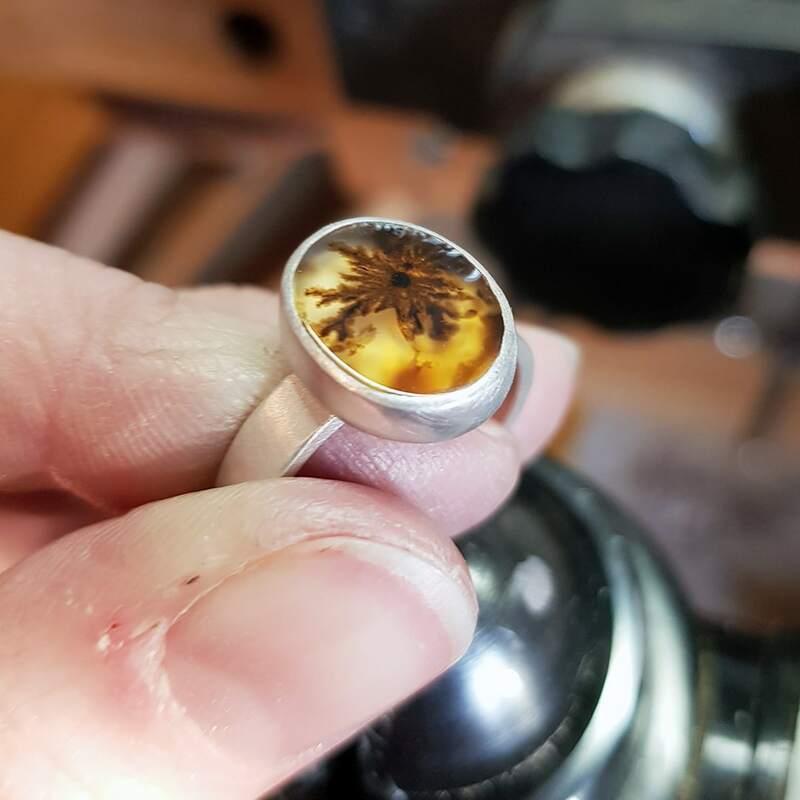 The picture below is showing the stone ready to set into the ring setting and the following show the ring finished. As you can see the ring with its medium size stone, is suitable to wear anytime. It can of course easily be worn on an everyday basis, which is the way it should be. 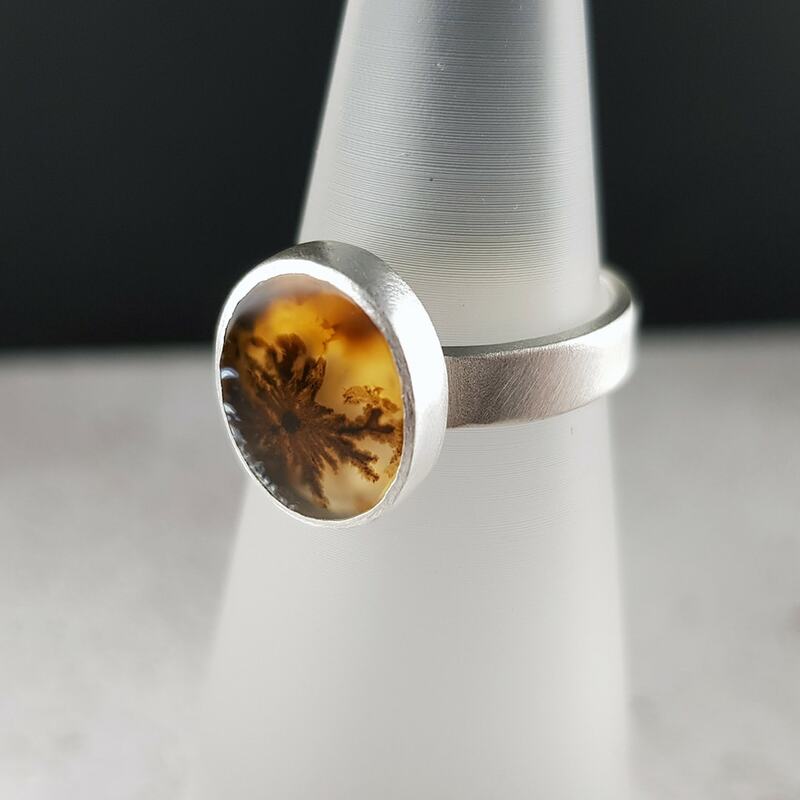 The colours and the understated natural elegance also contribute to the very wearable result of this dendritic agate ring. It’s always very important to me that functionality and comfort are high on the list of requirements of a successfully finished commission. It must be the Swede in me that insists on this! But of course, the most important thing is the wow factor, and THAT stone really IS something else! If you would like something similar made for you, just get in touch with me, via phone (07969 559 385) or email, or even messenger (see the little message prompt at the bottom right of the screen). I would be more than happy to discuss and hopefully work with you on your exciting project, where you would get to choose your own fabulous stone and design for your own piece, perfectly suited to you! 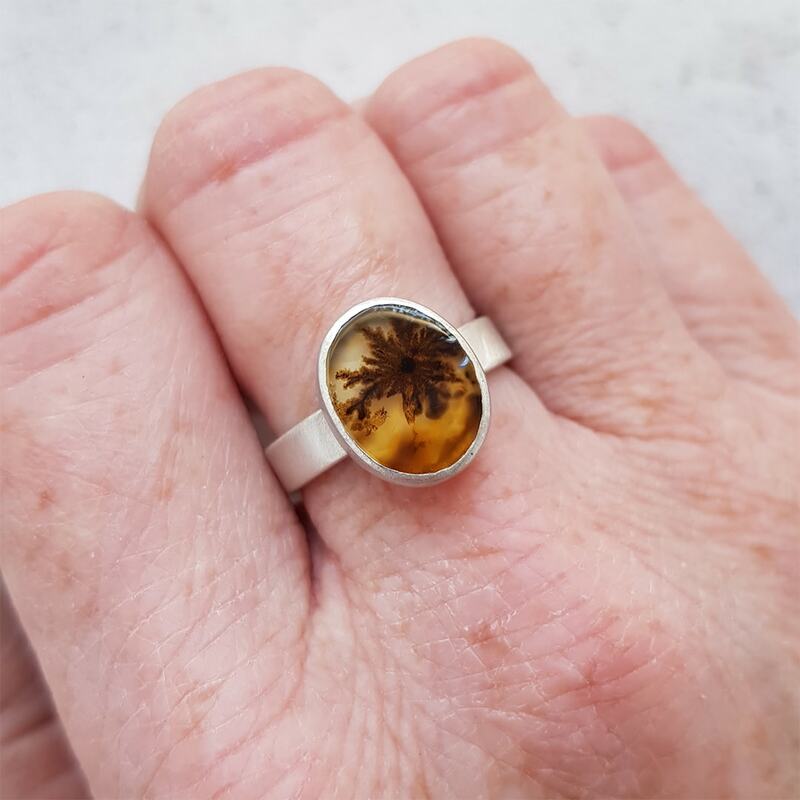 This entry was posted in Commissions, How it's made, Products & Collections, Scandi, Stones and tagged agate, bespoke, brushed silver, commission, dendritic, one off, ring, special order.